When it comes to mechanized animal-milking, Israel is considered a world-leader. Shlomi Azran, AfiMilk’s sales manager, proudly takes us around the dairy farms of kibbutz Afikim that was built in 1932. He enlightened about AfiMilk’s latest project in Canada: “The parlor set up with 30 positions on each side, with its capacity to milk 60 animals at each time. In an hour, it can milk 600 animals. We also built elaborated automatic gates that could steer the movement of the goats”. 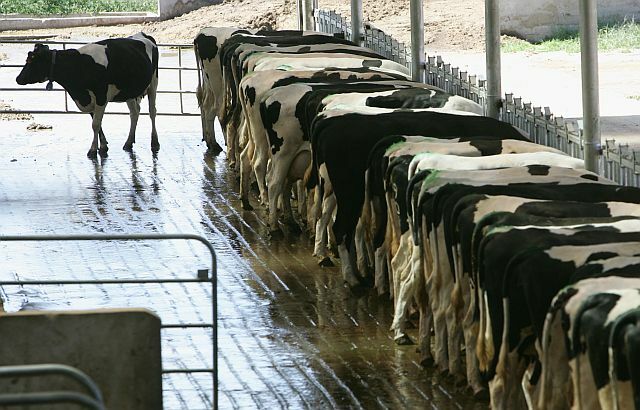 The average Israeli cow produces an impressive 12,000 litres of milk a year. AfiMilk’s system makes use of electrodes to measure the quality and quantity of the milk. The AfiMilk Milk meter is an integrated unit that combines individual cow’s milk measurement with full control over milking parlor activities. It accurately measures both milk quantity and milk conductivity to control cows’ performance and health. AfiMilk milk meters are designed to fit in every parlor configuration without any changes to the existing parlor equipment, either in a stand-alone mode or in conjunction with afimilk’s computerized system.